"National Due Process Day is September 25th!" The Fifth Amendment to the Constitution introduced on September 25, 1789 is the hallmark of the American legal system, guaranteeing that no person shall be "deprived of life, liberty or property without due process of law." The 14th Amendment expanded those rights. The National Association of Professional Process Servers honors this essential and sacred element of our way of life with National Due Process Day - a public awareness campaign designed to ensure that each and every American's right to a fair trial is forever preserved. 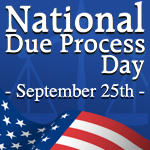 Process servers aren't the only ones who can spread the word about National Due Process Day. Paralegals, attorneys, judges, law enforcement, and any individual involved in the legal process can also take the time celebrate. Members of the legal profession know that without due process defendants would not be alerted of legal proceedings which would result in in an imbalance of power that could lead to imprisonment or punishment without allowing the defense to make a case. Celebrate and spread the word! A celebration of these legal rights is a great opportunity to connect with current and past clients through a social media campaign or special email. It also gives you a chance to spread the word about an important legal process to the people who are directly protected by it. Share examples of what life would be like without due process, fun facts (e.g. "No one shall be deprived of life, liberty or property without due process of law," is the only command stated in the Constitution two times), and your firm or sector's role in due process. In short, it's a great excuse to say hello to past and potential clients. "National Due Process Day is the creation of a day that honors the Constitutional right for due process . . . I think at the end of the day, National Due Process Day is about getting the information [on why due process is so important] to the general public. It's promoting the process serving profession in a very positive way." "The public needs to understand what we do and what our purpose is in the judicial system. We're there just to deliver the papers to give them the right to go and speak on whatever complaint or issue is being brought before the court against them or on their behalf." "The National Association of Professional Process Servers is sponsoring the first National Due Process Day on Sept. 25 - the anniversary of the introduction of the Fifth Amendment guaranteeing every American's right to fair treatment under law. The public awareness campaign is designed to promote a better understanding of due-process rights and their role in helping set the American justice system apart from all others." ServeNow has worked with President of the National Association of Professional Process Servers Eric Vennes to help promote National Due Process Day.